I’m a firm believer in the 80/20 rule – eat well 80% of the time, and treat yourself 20%. Whether you work out regularly or not, everyone deserves a day off the wagon, right? Yesterday was that day. A long awaited rest day after five hard boxing sessions over four days, I started the day with a lie in. Or at least I tried to – Mr Body Clock was having none of it so I was up and about by 8.30. A bacon and cheese toastie was inserted into my face immediately before hubs got back from parkrun. I promised myself that the only exercise I would do yesterday was to cycle the nearly two miles to ChocoHolly’s Chocolate Workshop on Western Road, Hove. I kept that promise, and returned with a bag of delicious hand crafted, organic 80% dark chocolate and a brain full of chocolate facts. For those of you not in the know, ChocoHolly is run by the lovely Holly Caulfield, a very talented artisan chocolatier who invited us along to The Chocolate Workshop to learn how good chocolate is really made straight from the cocoa bean. The first thing that hit me as I stepped inside the shop was the smell. Pure, unadulterated JOY, that’s what it smelt like. Rich, creamy, delicious chocolate fumes made their way pretty swiftly up my nostrils and something told me this was gonna be a good day. Stacks of beautiful, handmade truffles sat temptingly on tiered plates and delicious, organic chocolate bars lined the shelves around the shop. We were greeted with prosecco and truffles (I went for a cup of tea as not drinking until after my fight) and shown the (actually very complicated) process of making chocolate as part of Holly’s Bean to Bar workshop. First we were shown the cocoa pods in which the cocoa beans live. 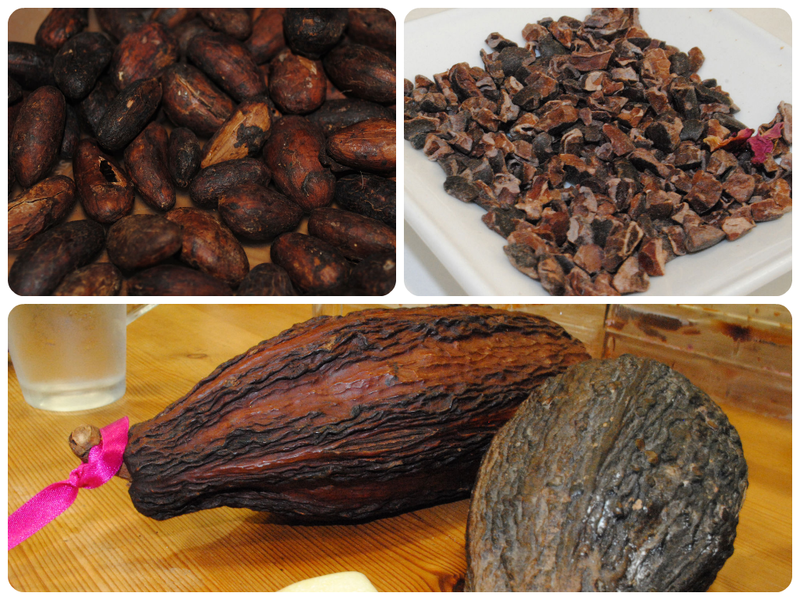 The cocoa pods are picked from the cacao trees, dried and broken open to reveal the beans inside. The beans are roasted for 23-28minutes before being peeled (winnowed) – Holly does this by hand and the painstaking process takes four days just to do 2kg worth. Larger chocolate manufacturers will use machines for this process. The crushed and peeled cocoa beans (nibs) are put into a machine for conching. 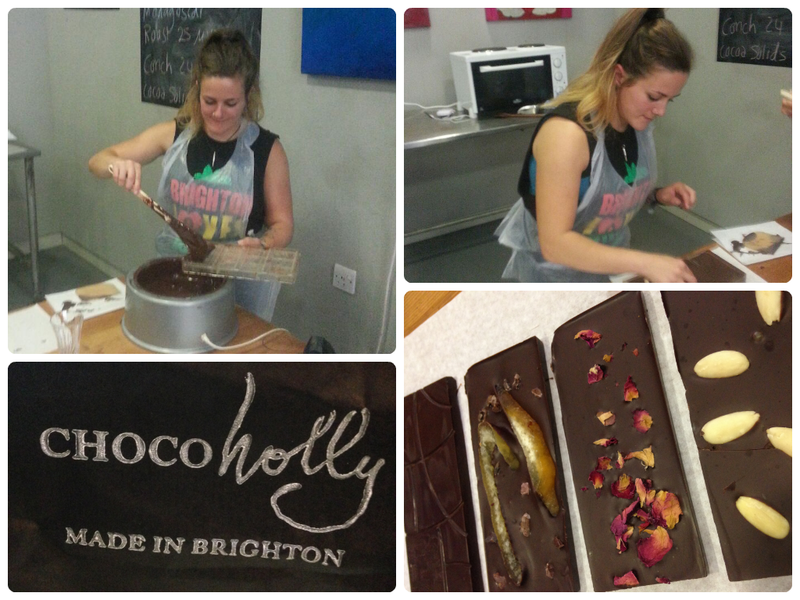 This process can take anything from 24-48 hours and it takes about a week for Holly to finish a batch of chocolate bars from 2kg of beans. Once the conching is process is complete, 20% cane sugar is added and the chocolate is tempered, which is raising and lowering the temperature of it to allow crystals to form. These crystals form a structure that result in a shelf stable chocolate with a shiny sheen, nice snap and smooth texture. Holly basically poured melted chocolate all over the (very clean) work surface and played with it for a few minutes to bring it down from 45 to 28degrees. I had to fight the urge to get in there with a spatula myself and shovel it in my gob I can tell you. After the chocolate was reduced to the correct temperature it gets put back in the bain marie and poured into the chocolate moulds. We all had a go at this bit – adding rose petals, almonds, orange and raw cocoa nibs to add texture and flavour to our bars. Mine were far from perfect but I guess that’s why I’m not a professional chocolatier! It surprised me how healthy cocoa solids actually are. They’re full of nutrients and antioxidants such as theobromine, phenethylamine and caffeine, which are linked to serotonin levels in the brain. They’re also rich in a number of essential minerals such as magnesium, zinc, calcium, iron and potassium, and also bursting with vitamins A, B, C and E.
It’s only when you add sugar and other ingredients to the raw cocoa that it loses its nutrients. Holly told us that lots of global chocolate manufacturers use poor quality cocoa beans and some chocolate only has 20% cocoa, with the rest comprised of sugar, other chemicals, flavourings and products such as vegetable oil! I knew that dark chocolate was meant to be healthier but never understood why, until now. The percentage you see on the packets of good quality dark chocolate refers to the level of cocoa solids within the ingredients. So a 100% bar would contain zero sugar at all, and 80%, which was what we made yesterday, contained 20% sugar. The taste was very rich but slightly too bitter for my liking, I prefer 70% as it’s just that little bit sweeter without losing all the goodness. White chocolate (my favourite) actually contains NO cocoa bean at all and is comprised of cocoa butter, milk and a shed load of sugar. Damn you Milky Bar! The Bean to Bar workshop is just one of the many classes run from The Chocolate Workshop – there are chocolate tasting sessions, sugar skull decoration classes, truffle making and a whole host more to get stuck into. The October class schedule is already filling up so if you fancy a go get in there quick! Visit www.chocoholly.com for more information on classes and tasting sessions. Are you a white, milk or dark chocolate fiend? What’s your favourite chocolate? Mine’s a pretty even split between Kinder Bueno, Milky Bar and Ferrero Rocher – I need to find a dark chocolate favourite! Previous Post 12 days until fight night!